Noelle Lambert never wavered in her determination to get back on UMass Lowell’s Division 1 women’s lacrosse team. After losing her left leg in a moped accident on Martha’s Vineyard in 2016, Lambert trained with ferocity. And when she played her first full collegiate game with her prosthetic running blade last April, she scored. Now the UMass Lowell senior wants to help others. She founded her own nonprofit, the Born to Run Foundation, to help young amputees receive athletic prosthetics. Specialized athletic prosthetics can range from $5,000 to $100,000, she said. They are generally not covered by insurance. Four-year-old Isaak Depelteau of Amherst, N.H., is the foundation’s first recipient. He received his Batman-themed running blade just before his 4th birthday. The toddler’s left leg was amputated when he was 2 due to neurofibromatosis, a genetic disorder that causes tumors to form on nerve tissue. Parents Derek and Sarah Depelteau had two options — have Isaak undergo multiple surgeries throughout his childhood, or amputate. Lambert, of Manchester, N.H., said that seeing Isaak on his little blade was emotional, as well. “Within an hour, he was running up and down the hall like he’d had it for years.” Lambert, 22, is now focused on her upcoming lacrosse season. After graduation, she’s thinking about setting her sights on track and field at the Tokyo 2020 Paralympics. She also looks to get more involved with motivational speaking and working with her foundation, which has just named its second recipient: Emma Graham, 24, of Manchester, N.H.
For her efforts, Lambert will be honored with a Heroes Among Us Award at the Boston Celtics game on Saturday, Jan. 26. Lambert was taken to Martha’s Vineyard Hospital, stabilized and airlifted to Boston Medical Center, where what remained of her leg was amputated above the knee. Moran also suffered serious injuries to her right leg along with a shoulder injury, Judy Lambert said. In Boston, one of Noelle’s first visitors, aside from family, was her lacrosse coach, Carissa Medeiros. “I remember asking her if I was still on the team,” Lambert said. During the 2017 spring season, Lambert attended every game, cheering from the bench. When she received a running blade through Challenged Athletes Foundation and began working with a personal trainer, the improvements came quickly. In April 2018, Lambert scored her first game goal. Of course, Lambert never would’ve had the chance to run again if not for her specialized running blade. To go to the beach, she needs a different waterproof leg, which was donated by the Heather Abbott Foundation. Abbott was a survivor of the Boston Marathon bombing. “Seeing these foundations, it inspired me to start my foundation. Without them, I wouldn’t be able to go to the beach with my friends, or play sports,” Lambert said. So a little over a year ago, she established the Born to Run Foundation, a nonprofit dedicated to providing child amputees with speciality prosthetics. 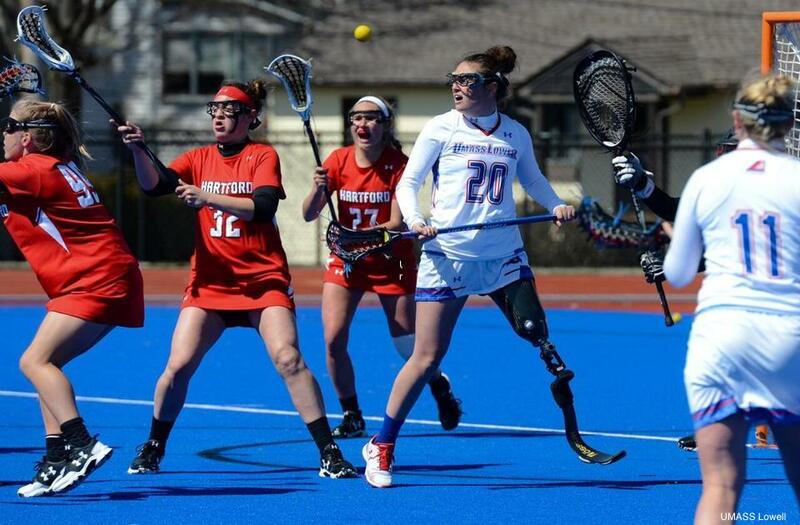 Lambert returned to UMass Lowell’s women’s lacrosse team after losing her left leg in a moped accident. Isaak Depelteau was born seemingly healthy, the day after Christmas 2014. But soon his mother noticed the infant’s left tibia and fibula were significantly bowed. Isaak was diagnosed with NF-1 caused by a spontaneous mutation. In the middle of his lower leg was a congenital pseudarthrosis, a fracture that would not heal, often called a “false joint.” In July 2016, Isaak broke his leg while playing in the driveway. The Depelteaus had two options: a childhood of surgeries for Isaak, or amputation. “In talking to a multitude of moms who had gone through this, by the time their kids were 8, they were asking to amputate. That held a lot of weight for us,” said Sarah. In May 2017, Isaak’s left leg was amputated below the knee at Boston Children’s Hospital. Isaak spent about a month in a cast. Some two months after, he was in his first prosthetic: a Spider-Man-themed leg. Here’s where their stories come together: Both Isaak and Lambert go to Next Step Bionics & Prosthetics Inc. in Manchester, N.H., and are fitted by the same prosthetist — a skier and former Paralympian named Jason Lalla. After Derek applied to Born to Run, the Lamberts saw an open letter he wrote to his son about the decision to amputate. The letter hangs in their home, and will someday be given to Isaak. “I wanted him to have a personal letter from me to him, explaining the journey, and how inspired I am by him — how well he’s been able to deal with this challenge and to overcome it,” he said.